The Juggernaut. 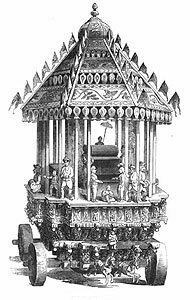 Hindus would sacrifice themselves under its wheels to attain heaven. 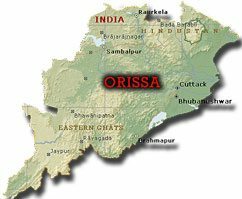 Little has been reported about ongoing violence in Orissa, India, the country’s 9th largest state in India with a population of 36.7 million, of which one percent are Catholic. Throughout the state, a significant anti-Catholic bias reigns. Converts tend to come from the lower castes of Indian society. They are despised as “inferiors.” Something embraced by the despisable must also be despised. Anti-religious violence in Orissa first appeared in the public eye in 1997 with the murder of Evangelical missionary Graham Staines and his two sons. A mob of frenzied Hindus led by members of the radical Vishwa Hindu Parishad (VHP) burned them in their car when they were taking a rest. The VHP is an organization that strives to unite Hindus worldwide to overcome the “evil influences” of Christianity. Swami Chinmayananda, a radical Hindu who taught and established schools of Hindu thought around the world, founded it in 1964. 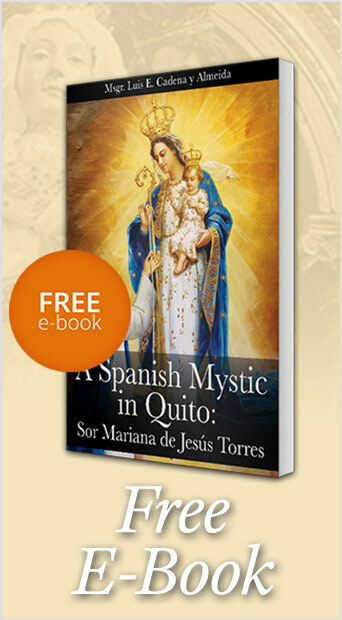 Many of the recent attacks against Catholics were instigated by members of this group. The group led another series of attacks during the Christmas Season of 2007 in the Kandhal district of Orissa. More than sixty churches, schools, convents and shelters were destroyed. More than one thousand Christians fled to refugee camps. Then, on August 23, 2008 Maoist rebels assassinated the radical VHP leader Swami Lakshmanananda. Local members of the group accused Catholics for his death and set off new waves of violence, with killings, torture and the destruction of private property. Violence escalated when angry mobs began attacking police stations killing one officer and destroying several stations. Anarchy is reigning there, and the worst part is there is no foreseeable end. “India: 53 arrested for attacks on Karnataka churches; Orissa Church life paralyzed,” Catholic World News, Sept. 17, 2008. http://www.catholicculture.org/news/headlines/index.cfm?storyid=426. “In Orissa Christians treated worse than animals, says Father Bernard,” Asianews.it, Sept. 10, 2008. http://www.asianews.it/index.php?l=en&art=13186&size=A. “Vatican condemns India attack,” International Herald Tribune, Aug. 26, 2008. http://www.iht.com/articles/ap/2008/08/26/europe/EU-Vatican-India-Orphanage-Fire.php. “INDIA: Catholics In Orissa Draw Strength From Eucharist To Cope With Fear Of Violence,” Ucanews.com, Sept. 16, 2008. http://www.ucanews.com/2008/09/16/catholics-in-orissa-draw-strength-from-eucharist-to-cope-with-fear-of-violence/. This entry was posted in News Commentary and tagged front page by Jose Walter Ferraz. Bookmark the permalink.